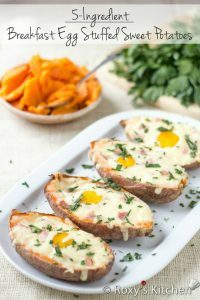 Cut of each baked potato (bake them the night before or use any leftover baked potatoes!) in half and scoop out some of the flesh. The more you take out the more cheese and bacon you can add. Break an egg into each potato half, sprinkle some salt and pepper and top with mozzarella cheese. Add bacon and bake for 20 minutes at 350°F / 180 °C.